John Deere is adding three new models to its extensive range of lawn tractors and walk-behind lawnmowers for 2015. These include an industry leading innovation at the top of the range, for faster and more economical mowing. 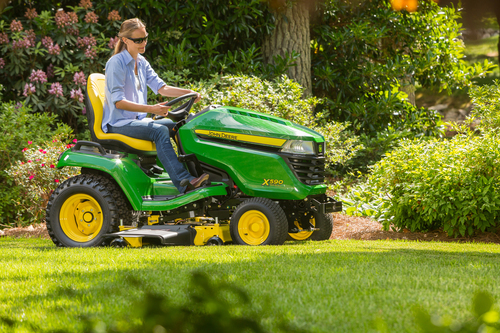 The X105 lawn tractor is the smallest model, and the lowest priced, in John Deere’s proven X100 range. Its compact size makes it ideally suited for smaller gardens and for manoeuvring in tight spaces like narrow gateways and intricately landscaped gardens. Effortlessly simple to operate, the continuously variable transmission (CVT) means that a single drive pedal and a forward/reverse lever control the direction. With a cutting width of 107cm (42in) and an adjustable height of cut from 25 to 100mm (1 to 4in), this versatile side-discharge lawn tractor is suitable for areas of grass up to 4000m2. Optional features include a 230-litre collection system and a mulching kit. The second new model is the X115R lawn tractor, which is now John Deere’s entry level rear discharge/rear collect model. The high capacity 300-litre collector means faster work with fewer stops to empty the clippings, which is quickly done from the operator’s seat. The 92cm (36in) mower deck includes an integral water hose connector to make cleaning very easy. Height of cut is adjustable from 25 to 90mm (1 to 3.5in) and there is an optional mulching kit. The new top of the range X590 Multi-Terrain lawn tractor combines higher levels of power, performance and comfort, and is particularly suitable for homeowners with larger areas of grass (over 8000m2) or more challenging terrain. Twin Touch foot controls, power steering, a hydraulically operated mower deck and an easy start engine provide a car-like driving experience. Mowing time is much quicker thanks to an industry first on a lawn tractor, the new constant-speed governor. This maintains the tractor and the mower blade speed even in heavy grass conditions by electronically controlling the amount of fuel supplied to the engine. This also improves cut quality and reduces fuel consumption. The X590 comes with a choice of 122 or 137cm (48 or 54in) mower decks, both with an adjustable height of cut from 25 to 102mm (1 to 4in). It features a comfortable, deluxe high back seat and optional extras include a collection system and mulching kit. In addition to these three models, the popular X125 lawn tractor has been updated for 2015 with a more powerful engine and a higher specification seat and steering wheel, for improved cut quality and comfort. All these new lawn tractors are available through the John Deere homeowner dealer network from spring 2015, and can be seen at the national John Deere Homeowner Experience Day, taking place at dealers throughout the UK and Ireland on Saturday March 21.